have to be rotated with other repellent brands. Remove cap and inner seal. Replace cap and tighten. (Retain and replace inner seal to preserve freshness during storage.) 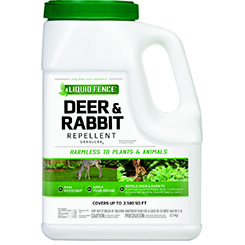 Apply Liquid Fence® Deer & Rabbit Repellent Granular2 evenly on and around low-growing flower beds, landscaped ornamental gardens, ground cover and lawns. Vegetation will be protected up to 24 inches in height. Reapply every three to four weeks. Reapplication is recommended after excessive rainfall. 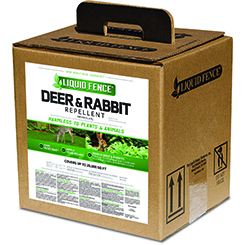 In areas where feeding pressure from deer and rabbits is intense, additional and/or more liberal applications may be needed. 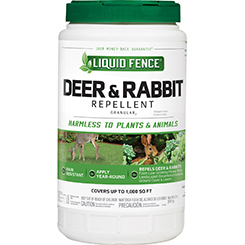 For protection of vegetation above the height of 24 inches, we recommend using Liquid Fence Deer & Rabbit Repellent Ready-To-Use2. STORAGE: Store in original container, in a cool, dry area inaccessible to children and pets. Protect from heat and freezing. Store between 40°F and 90°F. Keep containers closed tightly with inner seal in place to prevent drying out. If spillage occurs, sweep up.